What Happens When the Magical Girl Grows Up? We’ve probably all heard of “Magical Girl” stories – figures like Sailor Moon. “Magical Girl” stories generally feature teens who are suddenly called upon to fight forces of evil, given superpowers and magical items, and through their fights learn about responsibility, friendship, and the power of community. But.. what happens when the “Magical Girl” grows up? 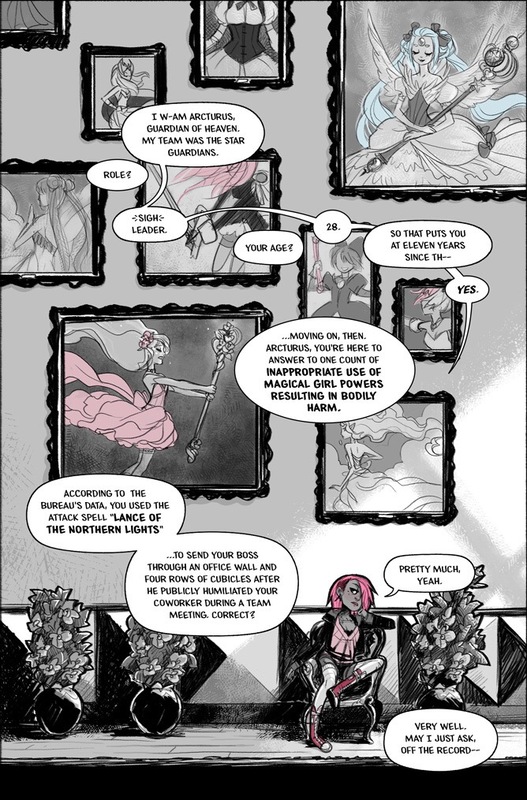 Nicole Chartrand’s Shattered Starlight comic explores a woman who used to be a Magical Girl and has grown up. 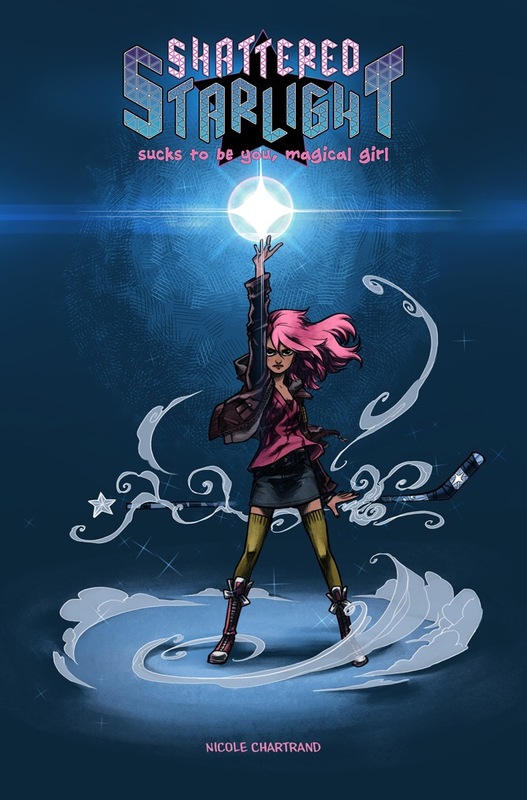 She still has her powers and her mystical hockey stick, but she also has all of the issues of an adult – having to deal with problematic bosses, watching friendships change and fade as people get older and find out new things about themselves, and dealing with moral grey areas. Arcturus, Guardian of Heaven contrasts with many of the magical girl tropes. Her magical handler is an alcoholic who no longer provides much in the way of guidance. Her teammates have mostly gone their separate ways, challenging the Magical Girl trope of community and friendship. Now everything is about to change for her. Her role as a Magical Girl turned woman is shifting and she is told by her boss that she should think of the change in her role as being like a new job. Chartrand wrote and illustrated the comic, illustrating her proficiency at both. The characters, drawn with huge eyes and expressive faces as well as incredible costumes evoke the golden age of Magical Girl stories, and also show how hard it is for Arcturus to fit in with her contrastingly simple outfit. At times she is overwhelmed by walls of previous magical girls in typical costumes, dwarfing her and portraying her as a small part of a larger tradition. Chartrand illustrates the complicated fit of Arcturus in this world of magical girls. To discover more about Shattered Starlight and Nicole Chartrand, visit http://www.shatteredstarlight.com/about/ . 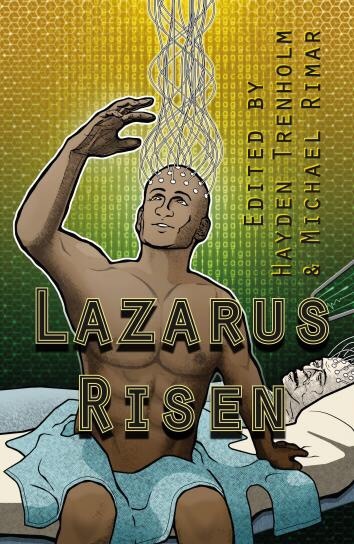 Hayden Trenholm and Michael Rimar’s collection of fiction Lazarus Risen constructs itself as a collection of stories about the biological singularity, exploring “dreams of immortality and eternal youth”, yet most of the stories in the collection bring attention to that spectre that always haunts ideas of youth – old age. This is an anthology that is well-timed and extremely important as ageing gets codified in political policies and ideologies that largely examine ageing as a social burden. These stories provide a challenge to easy ascriptions of ageing and interrogate assumptions about ‘old age’. They provide a foundation for a genre of Ageing Futurisms, which is a genre we desperately need as our societal views of old age continue to be narrow. Lazarus Risen explores the complexities of ageing and the potentials that exist within ageing bodies and identities. Most of the tales that we encounter, whether through speculative fictional lenses or through realist genres, tend to focus on youth, constructing 20-somethings as the harbingers of “relateable experiences”. Our social favouritism toward youth feeds our social obsession with staying young, holding all of the negative implications for those who don’t fit this social mould of youth. Ageing people tend to be constructed as, at best, inconveniences, and at worst, are erased because they are seen as being non-contributors. We create social ideas that the aged have been erased from our society by virtue of not contributing in the economic ways that we construct as normative, ignoring all of the ways that ageing people contribute to society and add to our social growth. It is fascinating that so many speculative fiction texts erase ageing people from their narratives (or cast them in stereotypical roles such as the role of the mentor or the burden to the narrator) because age is something that is fundamentally connected to a major theme in speculative fiction – change… and age is powerfully connected to the idea of the future and the passage of time, which SF frequently interacts with. We pretend in our society that “coming of age” happens only once – in the transition between childhood and adulthood, yet we are ALWAYS coming of age, always moving from one age category to the other and shifting and changing to accommodate those movements. Lazarus Risen provides a space for examining the way that we keep coming of age, that people keep shifting and changing over the course of their lifespan. Like any SF collection, Lazarus Risen deals with the social changes that come with technological changes, but the tales in this collection centre the human (or inhuman) experiences that come with these changes, exploring how “what it means to be human” is something that always has to run after our technological imagination, constantly redefining itself. It is the focus on the human experience that makes this collection a powerful one, and it is the focus on age that makes it one that is both timely and necessary. Lazarus Risen makes readers confront their insecurities about the spectre of ageing, makes us examine that biological clock that keeps ticking away, reminding us that change is inevitable and that change comes with constant new wonders, excitements, and, yes, challenges. 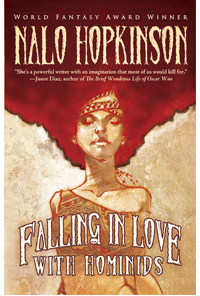 Nalo Hopkinson’s “Message in a Bottle” explores the strange nature of children and the complicated reaction people have to children who don’t fit the norm. The narrator, Greg, explores the social pressure to have children and his own perception of children as “like another species”. Like many people who decide not to have children, he is told that his life has no value without children and that he is incomplete without passing on his “legacy”. Gradually over time, Greg begins to decide that having children is a good idea, illustrating the pressure to have children and how it overrides personal decisions. He begins to see children as not quite so foreign and strange, but there is one child that continues to seem odd and displaced to him, his friend’s adopted child Kamla, a girl who has a recent syndrome called Delayed Growth Syndrome. Children who have this syndrome develop large heads, but their bodies are relatively slow to develop. The oddity about Kamla, however, is not the size of her head (at least for Greg, though others call her Baby Bobber), but rather the odd insights Kamla shows into the future and her oddly adult manner of speech. Hopkinson’s “Message in a Bottle” disrupts traditional ideas about aging and explores the discomfort that adults feel when children act or talk like adults. “Message in a Bottle” challenges embedded ideas about aging, encouraging the reader to question notions of “coming of age” and re-think aging as a simple binary of child/adult. Hopkinson questions ideas of time and temporality by playing with the time travel narrative while simultaneously disrupting the idea of traveling as an adult and instead investing children with “knowledge beyond their years”.